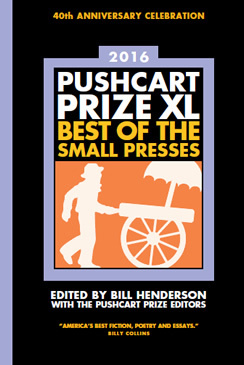 The end of 2015 is nigh, and for small publishers like Empty Sink Publishing, that means that exciting time of year is upon us—The Pushcart Prize nominations! For those unfamiliar with the award, this is an American literary prize that recognizes the best “poetry, short fiction, essays or literary whatnot” featured in small presses over the previous year. Winners of the prize are published in a grand anthology; these anthologies have been published annually since 1976. Each publication can nominate up to six works they have published—and since we’re not the type to just stop short, we submitted the full six titles for the award this year. Much like last year, the decision was difficult as we have been inundated with fantastic contributions, but these were the ones that stood taller than the rest. Somewhat confusingly, the best of 2015 are published in the 2017 titled anthology, but we’re not going to let that harsh our mellow. So without further ado, we would like to announce our six candidates for the prize this year. Drum-roll please! We would like to congratulate these six talented writers, and we would also like to thank ALL of our contributors for making 2015 a resounding success!